Earn 3.75 Creds Per $ Spent at Crazy Sales ? Get this deal now at Crazy Sales Or Join for free to earn eligible Creds! CRAZY DISCOUNT! Was: $299.95 Now: $149.95! Limited time offer and while supplies last! 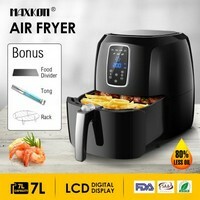 Cook food with 80% Less Oil with the Maxkon Oil-less Air Fryer Cooker 5.5L with 0-60 Minute Timer White. This cheap air fryer lets you prepare food that is crispy on the outside and tender on the inside. This offer is only valid when checkout is completed within the indicated promotion time.